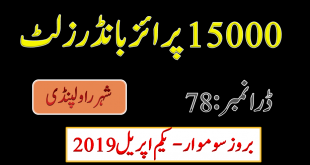 Today Directorate of National savings of Pakistan Prize bond rupee Seventy-Five Hundred (7500) draw is being held in Muzaffarabad city. The draw of Rs. 7500 is named seventy sevenths (77) draw till so far for this medium range denomination. Prize Bonds are widely acknowledged as a safe and secure financial investment. 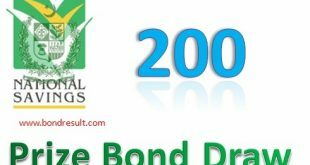 All the Govt employee men and women and limited investors can easily purchase in these 7500 prize bonds and try their capital without the risk of loss of their hard-earned revenue. The blessed draw for the prize bonds held after a variety of months. The first prize, second prize, and 3rd prize have a worth of Rs. 15M, 5M, and 93 Thousand rupees respectively. According to Kohenoor TV live broadcast, the new announces that first winner lucky number is 477399 that have won 1.5 Cror. And the Three lucky winners 457232 634726 and 921084 got five million worth prizes in Muzaffarabad city. Now the third list is coming tonight that who will get 93 thousand prizes of 1696 lucky prizes. Get the full third list below.